Retrofitting a robust, low-wear volumetric feeder has provided Johnstown, Pa.’s Riverside Water Treatment Plant with improved performance and trouble-free lime feed. 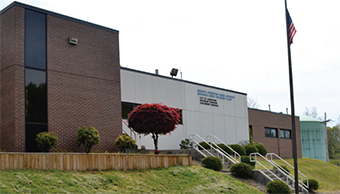 The 14 million-gallon-per-day (mgd) Riverside Water Treatment Plant serving Johnstown, Pa., has been in operation since 1985. The plant, together with its 5 mgd sister facility, the Saltlick treatment plant in Mineral Point, Pa., provides drinking water for approximately 21,700 customers in Cambria and Somerset Counties, including 15 boroughs and townships. 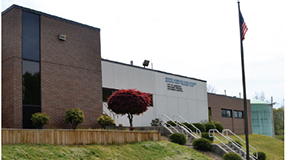 In addition to the two water filtration plants, the Greater Johnstown Water Authority (GJWA), managed by RDM, has more than 300 miles of water main lines, 17 pumping stations and 33 water storage facilities with more than 25 million gallons of water storage, which represents approximately 400 percent of daily demand. Average water consumption is around 6.5 mgd, with 10 mgd peak consumption in the summer. Although a number of expansions and improvements have been made to the direct filtration facility over the years, the Riverside Water Treatment Plant operates today essentially as it was originally designed. Treatment processes include rapid mix, flocculation, direct filtration and chlorination. The plant operates eight dual media filters. Lime is added both pre- and post-filtration for pH adjustment. Pre-filtration pH is maintained at approximately 6.5. The plant draws from three reservoirs at various times of the year, and raw water pH dictates lime feed rates. Target postfiltration pH is 7.3 to 7.5. Three lime feeders are used; one for pre-filtration, one for post-filtration and the third unit is typically used as a back-up unit when one of the other two are being serviced. 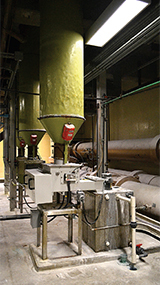 Recently, the plant needed to identify less maintenance-intensive replacements for its three lime feed units that had been in operation since the facility first came on line. The design of the gear-driven feed units were more than acceptable 25 years ago, but over time the units had become extremely labor intensive and growing problems with the feeders resulted in excessive operating and maintenance costs. Changing feed rates, for example, required a comprehensive resetting of the gears, a twoto three-hour procedure. Breakdowns had become frequent, requiring two to three hours of maintenance with each occurrence. Parts were becoming obsolete, expensive and hard to find. The gear chains often broke on the feeders and their rigid sweeper arms would wear out as well as various needle bearings and larger bearings. The design also made for a very complicated procedure to access components for maintenance. For example, it would take several hours to pull an auger off a unit. Each feeder operated on electrical pulse duration. The pulse turned the unit’s auger momentarily, feeding lime into a 50-gallon dissolving tank equipped with water jets near its base. The feeder then sat idle until it received the next pulse. Lime in the dissolution tank below would clump together during the 20- to-30-second intervals between the brief auger turns, eventually covering the jets and clogging the system, requiring an average of an hour and a half to properly clean out and get back on line. This occurred at least once a week per unit, and sometimes twice when feeding high dosing rates. In January 2011, the plant retrofitted its post-filtration lime feed system with a Type 405 Volumetric Multi-screw Feeder from ProMinent USA. The unit was installed directly underneath the original system’s 1,500-lb capacity hopper (Figure 1). After a local welding/ fabricating shop fabricated the stand and necessary fittings for the retrofit, plant personnel had the system up and running in about a day. 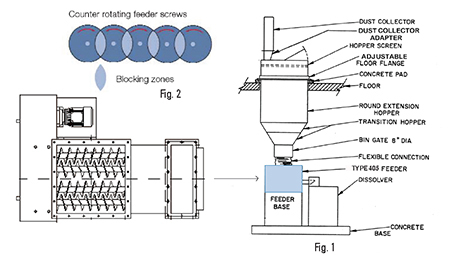 Unlike the previous feeder, which rotated a single wound pigtail to push the lime, the new unit uses five interacting, counter rotating feeder screws that create blocking zones (Figure 2), allowing the screws to be self-cleaning during operation. The multi-screw design also ensures that material is discharged over the whole active area of the feeder unit. The multi-screw feeder’s 1/3-hp variable-speed motor allows it to feed lime from 0 to 46 lbs. of material per hour. The plant set up the feeder motor with an AC/DC inverter and lime feed rates were established at settings ranging from 1 hz through 60 hz. At 11.5 Hz, for example, the unit feeds 425 lbs of lime per day. Although it has automated capabilities, operators currently run the lime feeder on manual control and make any necessary adjustments based on pH tests every four hours. A simple turn knob changes feed rates, compared to the several hour procedure of re-setting the gears on the old unit. The new feeder is in continuous operation, continuously feeding lime, but movement of the feed screws is barely perceptible when running at 1 to 6 hz. But by continuously feeding lime, regardless of feed rate, the unit is less susceptible to bridging and clogging. The new unit also provides a much wider feed path. Whereas the previous design had just one 1½- inch-wide feed path, each screw on the new feeder provides about a 3-inch-wide feed path, allowing the lime to be pulled out in a much wider area. The new feeder has performed very well at the Riverside plant, and due to its robust and lowwear construction there have been no maintenance issues with the unit after almost a year in service. 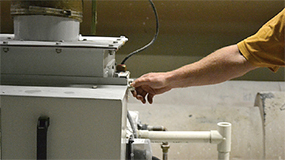 Maintenance staff performs weekly inspections to make certain everything is performing properly, but the only other maintenance activity regarding the feeder was to grease its fittings after six months of operation. There is no lime build-up in the system’s dilution tank below the feeder, whereas before, plant maintenance staff would have to remove half a 5-gallon bucket’s worth of clogged lime paste out a week. 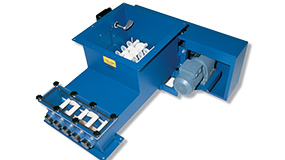 The 5-screw volumetric feeder provides an ideal alternative to conventional equipment such as wound wire pigtails, vibrating bottoms, rotary valves as well as ordinary single-screw feed systems. The difference in metering accuracy with the multi-screw design compared to a single-screw type is significant. The volumetric metering accuracy with a single screw is often worse than 5%, but with the multi-screw design accuracies are typically in the 0.5 - 1% range. The new multi-screw feeder serving the Riverside Plant provides continuous flight, forced discharge, and self-cleaning capabilities. Its discharge curve is linear, which contributes to its accuracy of better than 1%. This enables both batch and continuous processes to be accurately controlled. Because the multi-screw design ensures that material is discharged over the whole active area of the feeder, the material is prevented from bridging, ensuring that the principle of “first in, first out” is maintained. After the successful retrofit and operation of the multi-screw feeder, management determined the plant was saving about 20 hours a month in maintenance time and consequently elected to also retrofit the plant’s two remaining gear-driven lime feed systems with ProMinent Type 405 feeders, thereby improving performance and decreasing maintenance time even further. Once the two retrofits are complete, total time required for operation and maintenance for lime feed is estimated to be 95% less of what it had become with the original lime feed systems. In addition to better lime feed and process control, the overall quality and robust assembly of the new equipment allows the lime feed process to run without constant operation and maintenance supervision. With the reduced operational and maintenance needs, personnel at the Riverside plant are now able to concentrate their time on the myriad of other details involved in successfully running a 14 mgd water filtration facility.